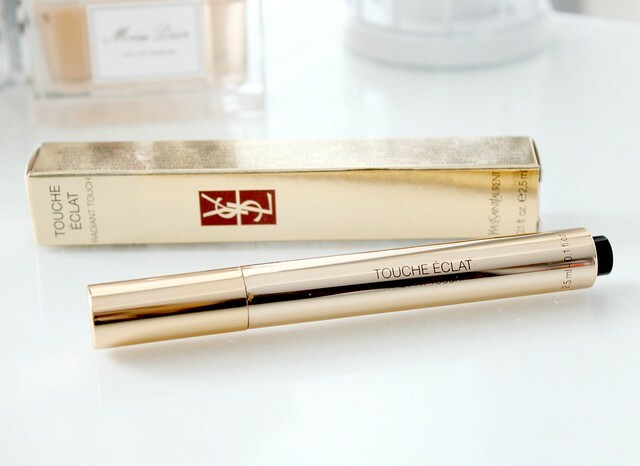 One of the most famous beauty products of all time, holding a 'cult' or 'holy grail' status amongst many beauty lovers is the YSL touche eclat. Known for its highlighting and illuminating properties, its the classic beauty product used for injecting some light and radiance to the face. Its something that had always been on my never ending beauty wish list but due to the high price tag, I just couldn't justify the purchase. However, my nanna and grandad were recently visiting my dad over in Australia and when they arrived home, they handed me a little package from my dad. Inside there was two beautifully packaged YSL products - the touche eclat and a rouge volupte lipstick. I was so excited to see these products as I absolutely love the rouge volupte lipsticks and as I said, the touche eclat had been on my wishlist for such a long time. 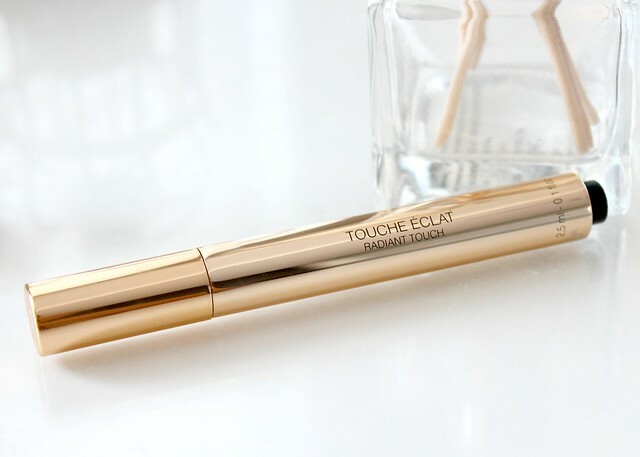 Firstly, I must point out how incredible the touche eclat packaging is. 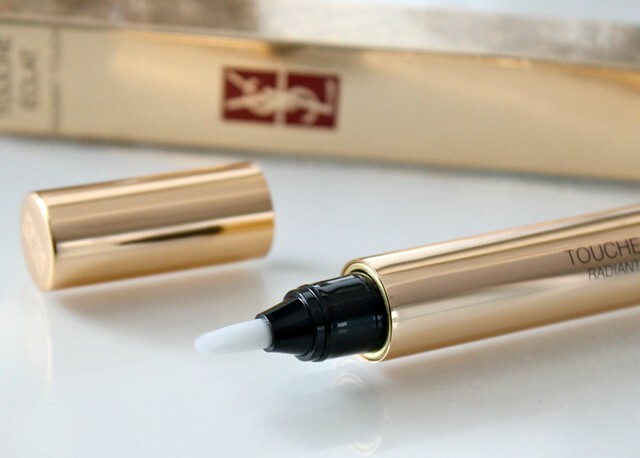 Like all YSL products, the gold packaging makes it so luxurious but the touche eclat has an even more luxurious feel to it due to the pen applicator being completely gold with the touche eclat lettering engraved on the side. I would definitely say its the most beautiful packaging I've ever come across and its such a pleasure to pull out of my makeup bag everyday. 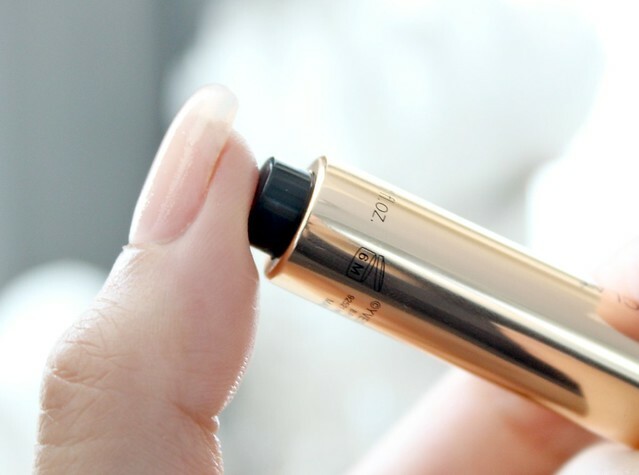 I also love how the product is dispensed from the gold tube via a click button at the bottom of the pen - its very satisfying to click and wallah, the product is dispensed onto the brush applicator. I think its the small things like this that take a product from high street to high-end! Now we've gathered that I love the packaging and style of application, do I actually like the product itself? Is it worth all the hype it receives? Well, I have to say, my opinion is mixed. As much as I enjoy using this product and have used it every single day since I received it, I don't think its worth the high price tag. 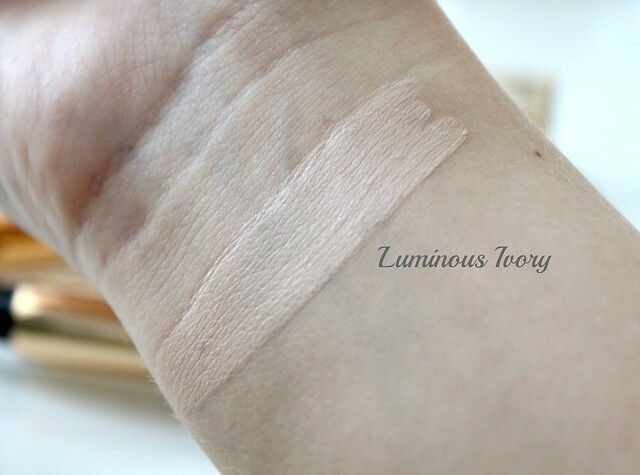 The shade I received is 'Luminous Ivory' which I believe is one of the lightest shades you can get and it works very well with my pale skin tone. I also find it has a slight salmon undertone too which is great for counteracting dark circles. I apply this in a 'V' shape under my eyes (I picked this trick up from Kim K's makeup artist) and I find it does a great job at brightening my dark circles and highlighting my face. It blends into the skin effortlessly too and instantly makes me look more awake. However, I've tried high-street products that have given me the same effect for a quarter of the price. That's why I feel like this product doesn't do anything miraculous enough to my face to warrant the £25.00 price tag. For this reason, I wouldn't repurchase. As I said, I've used products that have done the exact same job as the touche eclat, in particular the Loreal Lumi Magique highlighting pen which is known to be a dupe. Seriously, it does exactly the same job. Okay the packaging isn't as nice and it doesn't have a cool 'clicky' button but other than that, the product creates the same effect. It covers and brightens my under eye circles, and acts as a highlighter on any areas of my face I want highlighting (down the centre of my nose, brow bone, cupids bow etc). With this being said, as much as I'm thankful to my dad for buying me this and as much I've enjoyed using it, I just couldn't justify spending all that money on repurchasing it. I think if I was going to spend £25.00 on a concealer, it would have to make me resemble a supermodel after application. Doubtful, I know. 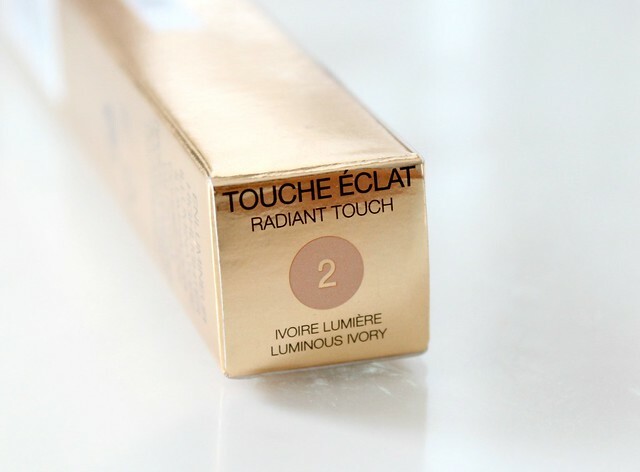 Have you ever tried the touch eclat? Do you think its worth all the hype it receives? You can find it online here. I have tried this before and I am uncertain about it too, I know it is meant to have salmon undertones but I found it too pink for my skin, I much prefer the Dior Skinflash highlighting pen! £25? Ouch - It is a bit of a hefty price tag isn't it! It is a great and luxurious product and the packaging is stunning. It does work well but as you say the hefty price tag is off putting and there are some great dupes out there for less. But it is always nice to have a luxurious item in the make up bag. I haven't tried it. I don't have enough money to my name to be able to buy it and not feel guilty. I use the Maybelline Dream Lumi Touch and I love that though. I have tried this many years ago and I must say I have to agree with you! I adore this, but for everyday I use the L'Oreal version. I don't think it's quite as good, but for everyday I can't justify spending that amount on a highlighting pen. I smiled when I read the title of this blog post because only last weekend I have actually (finally) purchased this product which it was on my never ending wish list as well! As you I have mixed feeling about it..I do really like it and I can see a big improvement on my dark circles however it's not something that i wouldn't find in other cheaper products. The packaging is gorgeous though and I will keep enjoy using it but not sure now if I will purchase it again. After my Maybelline highlighting pen is done, I will have to give the L'Oreal one a whirl. The packaging looks a bit nicer than my poor Maybelline one! My Maybelline is looking pretty old and busted, too. When I went to look at the name of it, it was all worn off and grungy looking. Bleh. I may have to copy off you and try the L'Oreal one next. So glad you did this post! The packaging is sooo gorgeous it almost makes it worth it! I've been using the mac prep & prime highlight in light boost, which is similar but I don't LOVE it-- so I plan on trying one of the l'oreal highlighters next! I haven't tried it, it just seems like pretty overpriced! I've heard that the version Maybelline has is pretty decent so I may try that first before splurging! Thanks so much for your review! I totally agree with you! Although I enjoyed using it, it isn't something I would buy again as I have one which is very similar for less than half the price! I agree that the L'Oreal is just as good...and a fraction of the cost. However, I do love all things YSL because the packaging is so luxurious..I just think you'll get more out of one of their mascaras or the rouge volupte lipsticks as those are such great quality. I really appreciate your honesty on this, as this is one of those products I've always been unsure if it was worth my money or not. Now I think I have a good answer! I've been wanting to try something like this, thanks for the review. Have you ever tried mac prep and prime, its also on my list of things I want to try lol? This has been on my list for so long! I use the Givenchy Mister Light pen which does the same I guess. I do love this product, it works so well to highlight and illuminate but there are much cheaper alternatives. I think if you can afford it and like what it does and use it regularly it is worth it. The packaging is so beautiful! Love this product, but its quite expensive! Great review, I'm still on my first YSL but after that one is finished I will look into more purse friendly ones .... I can imagine though that when it came out about 25 years ago it was the holy grail of make up and they were not many alternatives! I've heard lots of mixed reviews on this one, it used to be on my wishlist but it doesn't sound like its worth the money.. 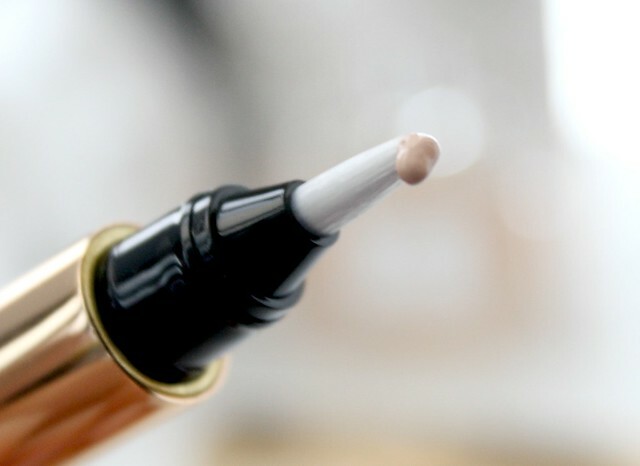 There are plenty of drugstore versions that seem just as good at a fraction of the price! I've always wanted to try this, but never did because of the high price tag - although I love the packaging, I think I'll give this a miss based on this review - I'll stick to the L'Oreal/Maybelline ones instead. love how you've photographed these Kayleigh! Oh wow - the packaging is gorge! It's amazing, but you're right about the dupes…Collection do one that's very similar and it's so cheap!